When it comes to tourism and natural beauty, there’s no area in Costa Rica that tops the growing popularity of the Guanacaste province. It’s located in the northwestern part of the country, along the coast of the Pacific Ocean. Liberia, Guanacaste’s capital city, is approximately 4 hours from San Jose and is also known as "The White City". Tourism has heavily increased in this area during the past decade, making Liberia one of the most developed towns in the country. It is also known for its folklore and customs, as well as for its convenient proximity to most of Guanacaste’s greatest beaches and resorts, such as the Gulf of Papagayo. One of the biggest advantages of Liberia’s development is its international airport (Daniel Oduber International Airport). International flights to Liberia Costa Rica is a major reason why tourism has boomed in this region, receiving flights from all over the world, especially from the United States. 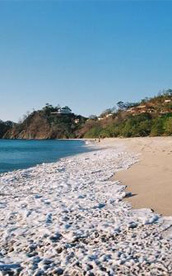 Guanacaste’s stunning beaches stretch from the border of Nicaragua to the Nicoya Peninsula. Beaches such as Tamarindo, Flamingo, Hermosa, El Coco, Samara and Nosara are some of the most beautiful beaches in Costa Rica, offering great surf and a wide variety of other water sports. Other exciting activities that visitors can enjoy while in the area include incredible wildlife watching, breathtaking landscapes, horseback riding and hiking tours. Guanacaste has a beach to fit every taste, from tranquil and solitary beaches to touristy and resort-loaded destinations. One-time fishing villages like Tamarindo are now quickly becoming resort towns. With a large influx of tourists and foreign residents, this beautiful area bears more resemblance to other touristy destinations such as Cancun, than typical Costa Rica. There’s a nice array of accommodation options throughout the province. Many of the new Guanacaste resorts are among the top hotels in the country, and even Central America. Guanacaste hotels have choices to suit pretty much any budget. And for those interested in more than beaches and crystal waters, Guanacaste also hosts tropical forests that characterize some of the most popular national parks in Costa Rica, such as Santa Rosa, Rincón de la Vieja, Palo Verde and Barra Honda. *Rates are subject to change without previous notice, according to any tax changes or any government regulations. The Costa Rica vacations planning site with information about accommodations, tours, transportation, maps of Costa Rica, main cities and travel tips.